Budae jjigae is a type of jjigae (a thick Korean soup similar to a Western stew). Soon after the Korean War, food was scarce in Seoul, South Korea. 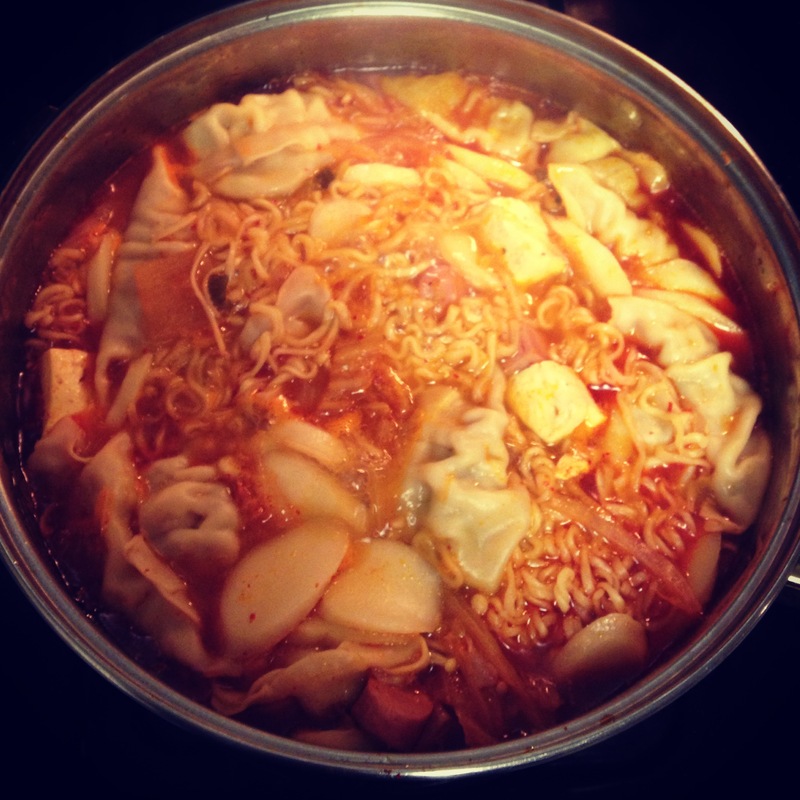 Some people made use of surplus foods from U.S. Army bases around the Uijeongbu area, Pyeongtaek area or Munsan area, such as hot dogs, canned ham, and Spam, and incorporated them into a traditional spicy soup flavored with gochujang (red chili paste) and kimchi. Budae jjigae is still popular in South Korea. The dish often incorporates modern ingredients such as instant ramen noodles and sliced American cheese. Other ingredients may include ground beef, sliced sausages, baked beans, dropwort, onions, green onions, tteok, tofu, chili peppers, macaroni, garlic, mushrooms and other vegetables in season. I have a super easy way of making this soup. First, I sautee onions & kimchi in a big pot, then add in chopped spam & Vienna sausage. Then I pour water in & let it boil. My secret is that I use the soup base from Shin Ramen– add that to the boiling water & let it simmer. Then you add in enoki mushrooms, sliced tofu, dumpling, rice cake & ramen. You can pretty much add whatever you want.. it’s spicy but oh so good.